Winter is officially over! Are you excited to get out of your hibernation in UNYP’s library or your student apartment, and enjoy Prague in all its flourishing beauty? Are you looking forward to sipping a refreshing iced coffee over a book on the terrace of one of Prague’s countless cafes and coffee shops, strolling in the park, checking out the program of the Prague Spring music festival, and of course, seeing some first-class art? After all, isn’t the cultural life why you chose the Czech capital as your Study Abroad destination in the first place? Prague has a thriving art community with a range of modern and contemporary art museums. While many are worth visiting for their stunning permanent collections, several have fascinating rotating exhibitions too. This fantastic exhibition celebrates 30 years of the Pixar animation studio. 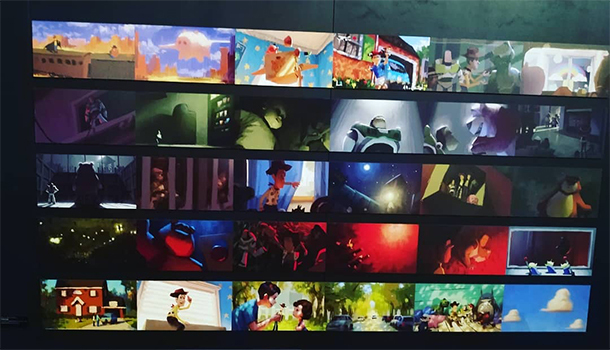 This exhibition presents the studio’s creative process and lets visitors take a look under the hood at how Pixar makes its films, combining original artworks and multi-media experiences. Featuring beloved characters such as Woody, Buzz Lightyear, Nemo, Dory, Mike, and Sulley. This year Prague hosts the second edition of Týden Umění/Art Week, which involves the city’s main galleries and art institutions. There will be about a hundred openings, artist talks, guided gallery tours, lectures, and seminars. The program focuses on a variety of aspects of the visual art world, with a general theme of “noble joy”. Photographer Jiří Hanke (* 1944) works on long-term, social documentary projects, often addressing his hometown of Kladno. The retrospective is dedicated to the artist’s 75th anniversary and consists of images shot between 1973 and 2018. This extensive collection of photographs will expand the horizons of viewers who are open to learning more about recent Czech history. East of Eden is a multimedia exhibition which combines drawings, paintings, and sculptures by Richard Stipl & Josef Zlamal. The artists create a figurative dialogue, raising questions about the creation of the world and our place in it, while the concepts of hope and faith become the recurrent theme of the installation. Symbolic works blend into the labyrinth of the museum's mysterious atmosphere, leaving the viewer with an engaging, almost spiritual experience. The exhibition incorporates a selection of curiosities and pictures from the museum’s extraordinary Czech and foreign collections. Curated by Petr Nedoma, "A Cool Breeze" is an exhibition of contemporary figurative sculpture – which explores new possibilities of figural representation in contemporary art. Eighteen international artists confront an old sculptural subject – the human body. The selection of works aims to challenge the traditional understanding of sculpture.